In 1824, John James Audubon was a struggling 29-year-old artist. He noted in his diary that he had made a drawing of small grouse to Philadelphia engraver Gideon Fairman. Fairman’s company specialized in printing currency for banks (each bank at that time issued their own legal tender), and the grouse drawing was meant to be on a New Jersey banknote. This diary entry, however, is all we’ve had to show for what could be the first published drawing by the ornithological master. Scholars have never been able to find the prints of the drawing or the banknotes. Robert Peck, curator of art and artifacts at the Academy of Natural Sciences, and Eric Newman, a numismatic historian from St. Louis, decided 10 years ago to work together to find the elusive Audubon grouse. Thursday they announced that they had found the Holy Grail of Audubon studies. On a trip to Chicago, Peck checked another diary, and found an entry from 1826. Audubon was in England, where his landmark book, The Birds of America, with full-size printings of his bird watercolors, was eventually produced, beginning in 1827. He noted that he presented a friend “with a copy of Fairman’s Engraving of [my] Bank Note Plate.” But had the money ever been printed? Or was it a plate that never got used? Finally, he reexamined his own collection of “sample sheets,” printed with various images that bank presidents might want on their bills. Mostly, such sheets contain portraits of George Washington and Thomas Jefferson, images of draped Lady Liberties, and, above all, eagles. But finally, on a sheet issued by Fairman’s firm, likely in 1825 – there! on the lower right! – was a grouse. 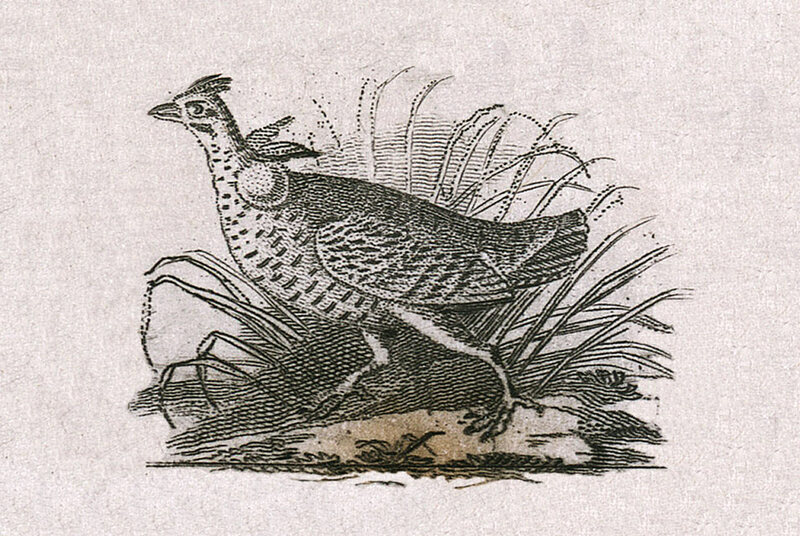 The drawing had no signature or attribution, but animal artists at that time made static depictions and this grouse is running against a backdrop of its natural habitat, a style that was singularly Audubon’s. 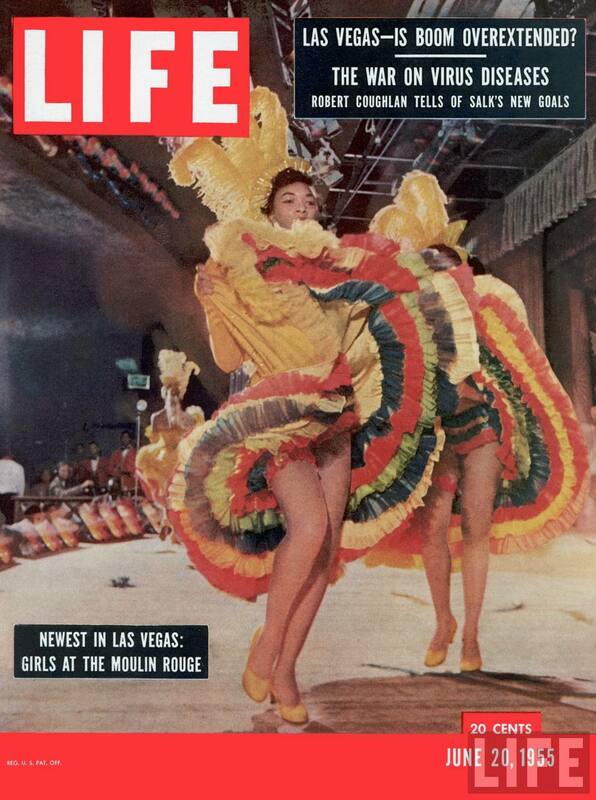 Peck and Newman think they’ve pieced together what happened. The New Jersey bank was probably the State Bank at Trenton who were major clients of Fairman’s company. The bank failed in 1825 and its banknotes became worthless. Forgers took those worthless notes and counterfeited them up to look like similar notes from another Jersey bank, the State Bank of Camden, that hadn’t gone bankrupt. Eventually the Camden bank recalled its currency and burned it along with all the Trenton bills it could find. That would explain why the small grouse seemed to disappear from the historical record. A broadsword made to commemorate the incredible journey of Robert the Bruce’s embalmed heart, carried by famed knight and loyal Bruce supporter Sir James Douglas on a crusade to the Holy Land which stopped fatally short in Moorish Spain, sold at auction Wednesday for £10,800 (ca $17,000). Sir James Douglas, known by the English as Black Douglas and used in songs to scare children, was with Robert the Bruce when he died in 1329. According to 14th century Scottish poet and chronicler John Barbour, Bruce asked Sir James to take his heart with him on a crusade against “Christ’s enemies” because Robert had always wanted to go on a crusade but was never able to. After Bruce died, his heart was cut out and put in a silver enameled casket which Douglas carried on a chain around his neck. Heart safely contained close to his own, Douglas headed out to war, eventually joining Alfonso XI of Castile in Grenada where he was besieging the Moorish castle of Teba. Barbour says Douglas acquitted himself with great courage in the battle, but he fell nonetheless. The battle was eventually won by the Castilian-Scottish forces, so Sir James’ body and the heart casket were retrieved by Sir William Keith and sent back to Scotland. The heart was buried in Melrose Abbey, as Robert the Bruce had requested in his will. Sir James Douglas’ remains were buried in St Bride’s chapel. From then on, the Douglas family coat of arms would bear a crowned heart in homage. The 14th century blade is thought to have been made shortly after Sir James ill-fated trip and is engraved with Douglas family heraldry, inscriptions referring to the heart and a commemorative date of 1331. 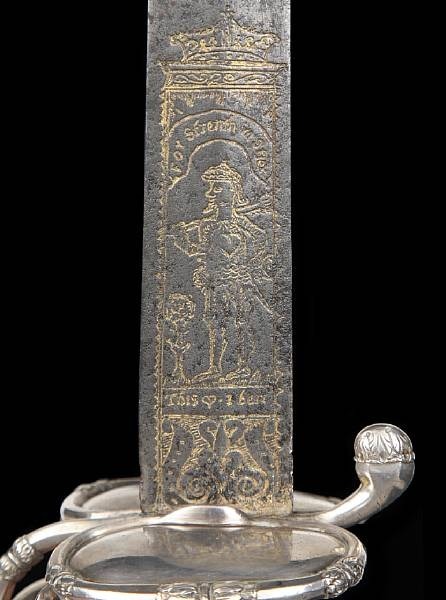 The sterling silver hilt was made in 1705 by London swordmaker Thomas Vicaridge and attached to the blade which had been in the Douglas family for 400 years by then. It carries an Imperial crown and a crowned lion rampant between the inscription ‘Pro Rege Et Regno Anno 1331’, and on the other with a similar panel enclosing one of the devices of the Douglas family, a wild man (wodewose) with a heart on his left breast between the inscription ‘For Strength In Stier This [the heart] I Bier’ (for strength in battle this heart I bear). The seller chose to remain anonymous, but members of the Douglas-Home family say it was sold by a relative. The buyer also chose to remain anonymous saying for the record only “It has gone to a Douglas.” Small consolation for Scots nationalists who have to accept that such a piece so interwoven with the dawn of independent Scotland and the death of its hero king will now disappear into an anonymous collection somewhere in England. 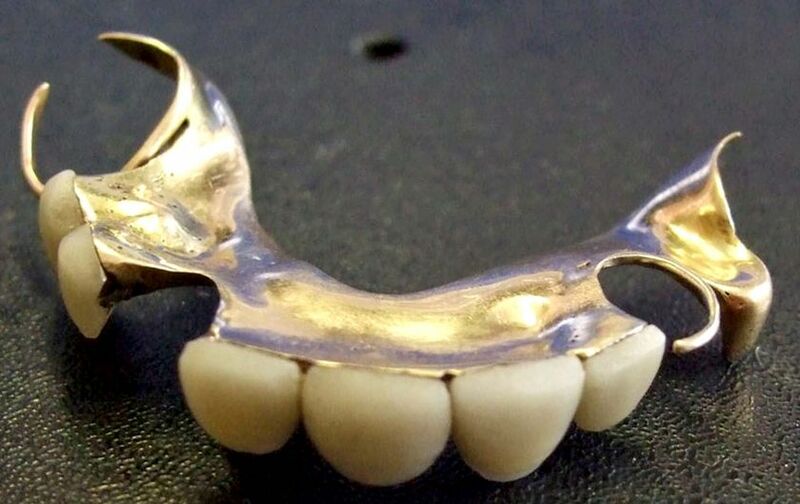 The set of dentures were designed to be loose-fitting so that Churchill could preserve the diction famous from his radio broadcasts during the second world war, an expert said. These dentures and 3 or 4 identical sets were made in the beginning of the war by dental technician Derek Cudlipp. Churchill carried an extra set with him at all times. One of the other sets rests in peace with the great man himself who was buried with them. Another set is on display at the Hunterian Museum, the medical museum of the Royal College of Surgeons in London. 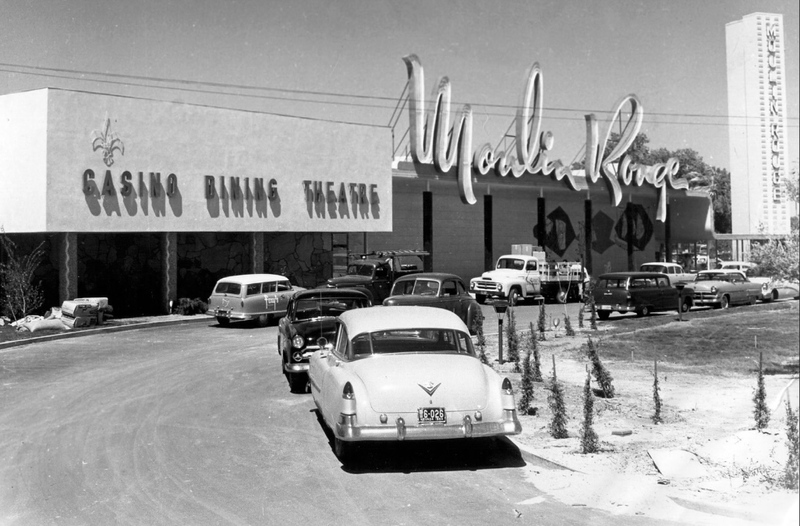 Mr. Cudlipp’s son Nigel sold this set. Winston Churchill personally destroyed Derek Cudlipp’s draft papers. According to Nigel, Churchill told the technician that he contribute more to the war effort by staying in England and repairing his dentures than by fighting on the front lines. He was probably right given how important the prime minister’s speeches were to become, and given Churchill’s habit of throwing his dentures across the room at his staff when he was angry. Nigel says his father could tell how the war was going at any given time based on how much repair work he had to do. On August 18th, a collaborative team from RMS Titanic Inc., the company that has salvage rights to the wreck of the Titanic, and the Woods Hole Oceanographic Institution will be returning to the wreck site not to recover artifacts, but to probe the entire debris field with the eventual goal of creating a 3D virtual rendering of exactly what is left of the ship 2.5 miles under the North Atlantic. It’ll be the first time the wreck is recorded like an archaeological site instead of explored for salvage booty (and to make the incredibly crappy intro of an incredibly crappy movie out of the underwater footage). The careful mapping will contribute greatly to our understanding of the historical Titanic and will also pinpoint the wreck’s current state of preservation. The plan is to share the virtual rendering with the public once it’s complete. The “dream team” of archaeologists, oceanographers and other scientists want to get the best assessment yet on the two main sections of the ship, which have been subjected to fierce deep-ocean currents, salt water and intense pressure. Gallo said while the rate of Titanic’s deterioration is not known, the expedition approaches the mission with a sense of urgency. 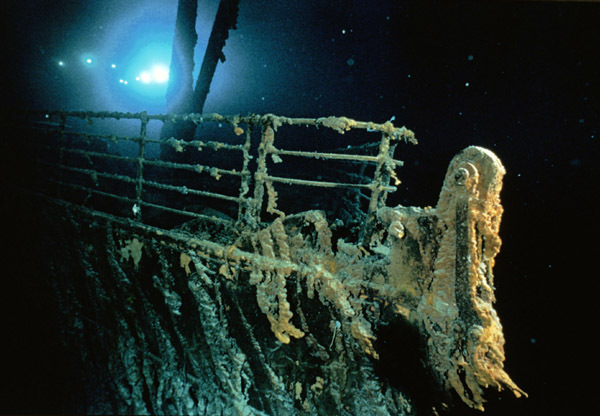 The expedition will use imaging technology and sonar devices that never have been used before on the Titanic wreck and to probe nearly a century of sediment in the debris field to seek a full inventory of the ship’s artifacts. The expedition will be based on the RV Jean Charcot, a 250-foot research vessel with a crew of 20. Three submersibles and the latest sonar, acoustic and filming technology will also be part of the expedition. They will also take samples of the iron hull, which they hope will answer some questions about how the ship went down. The 3D mapping of the debris field will also provide new information about what happened the night of April 14, 1912. Scientists will be able to examine in detail parts of the ship that haven’t been seen before because they’re jammed into the mud on the seafloor. The pictures the team retrieves from the submarines will be compared to the pictures taken on RMS Titanic’s first expedition to the wreck 25 years ago. They’ll be able to gauge the rate of decay over that period, and continue to gather data that might be key to conservation on future mapping expeditions. RMS Titanic, Inc., is still working on a website dedicated to the expedition, but they already have a Facebook page up where you can ask questions and follow the expedition. 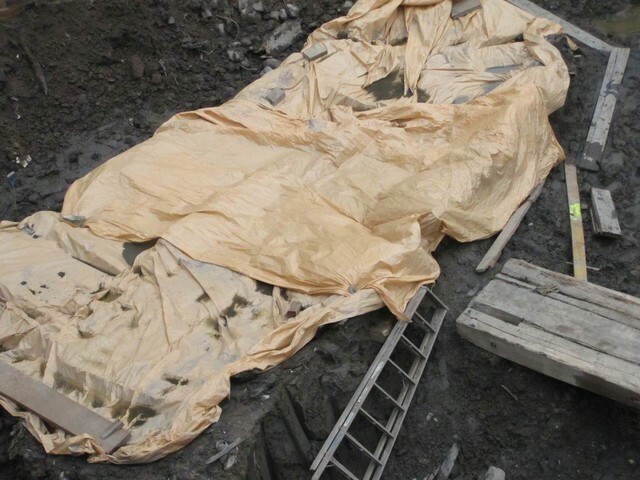 Archaeologists have begun to disassemble the 18th century ship found on the World Trade Center site. They started taking it apart, plank by plank, on Monday and are hoping to finish this week so construction crews can go back to work. As the mud is removed, the original color and grain of the wood is revealed. Disassembly also reveals the joining techniques that were used in the ship’s construction. It’s a race against time and climate, though, to keep the wood from degrading. 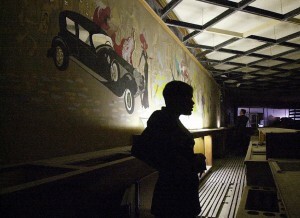 The boat was covered by a canopy to keep it as dark and damp as possible even in the middle of an east coast heat wave. Port Authority has authorized double shifts so the archaeologist can keep working day and night to get the speedily-disintegrating wood into a safe environment. 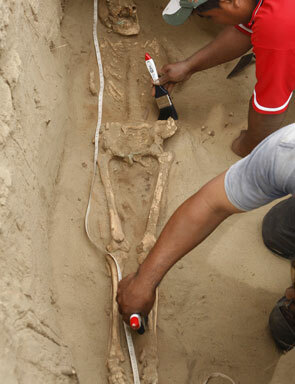 On Monday, archaeologists painstakingly tagged and logged each plank of the boat before removing it. “We’re recording everything as if each piece is going to fall apart — just in case,” said Warren Riess, a professor at the University of Maine who is working on the boat for AKRF. Workers wrapped each piece of wood in polyethylene foam and plastic sheeting, to keep the moisture in and the sun out, and then loaded them into a dumpster. The hundreds of timbers will go to the Maryland Archaeological Conservation Laboratory, about 50 miles outside of Washington, D.C., where archaeologists will study them further. The conservation process will take years. First the planks will be soaked in polyethylene glycol, a waxy plastic that will penetrate the wood and provide it a stable structure, for 3 years. Then they’ll be vacuum freeze-dried to drive out every last drop of water. Once that’s done, the ship will be put back together. Port Authority hasn’t decided yet what its ultimate fate will be. The Lower Manhattan Development Corp., owners of the site where the boat was found, will ask for public input on what should happen to the ship. Here’s hoping they choose to put it on display. There’s a great deal of documentation of government boats and warships, but private shipbuilders in the 18th c. didn’t publish any blueprints or design plans (they wanted to preserve their trade secrets), so there’s a lot this find can teach us about how these smaller privateers were built. So far we can tell from the heaviness of the planks indicate this ship was used to carry heavy cargo. It was probably 60 feet long (the section found is 30 feet long) which is fairly large for a ship that traveled the Atlantic coast. Ships that crossed the Atlantic, on the other hand, were usually considerably larger. It’s not likely to have been a dedicated slave ship. Slave ships were built for speed so they were usually lightweight. 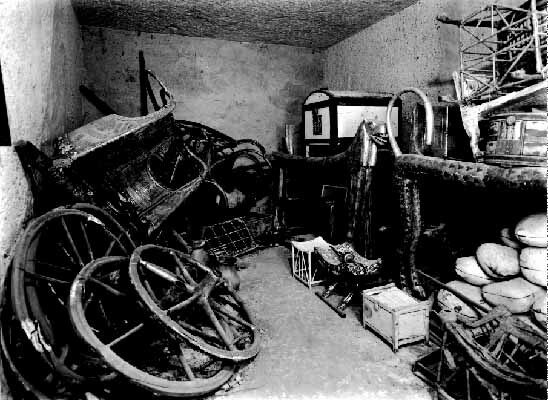 When Howard Carter opened King Tut’s tomb in 1922, he found 4 chariots in the south-east corner of the antechamber (2 more were found in the treasury room). 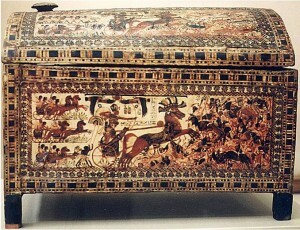 The chariots had been dismantled at the time of the King’s funeral. 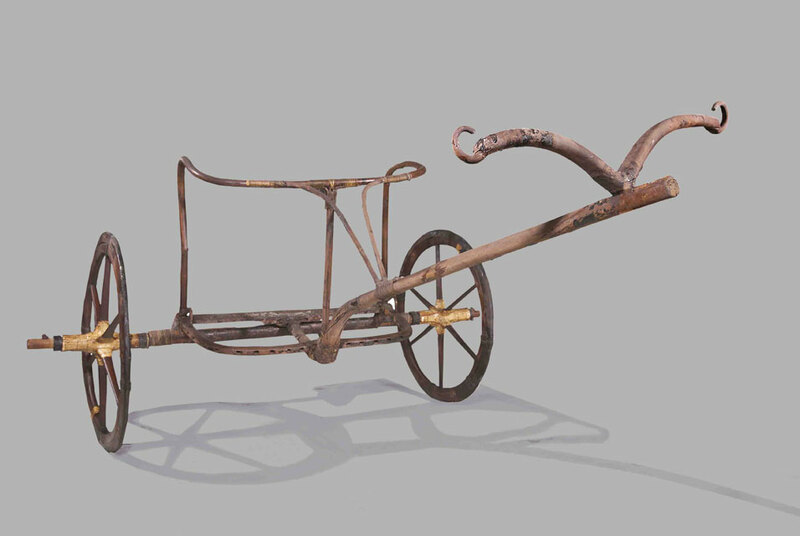 One of the chariots stood out not because of any elaborate decoration, but because of its lack thereof. Unlike the others, it was small, lightweight, and entirely undecorated. It also showed signs of regular use, again unlike the other more ornamental chariots. Carter deduced from its open design that it was used for hunting and/or quotidian exercise. Since a recent study of the king’s mummy found that he suffered from a severe leg fracture right above the knee from a fall taken shortly before his death. 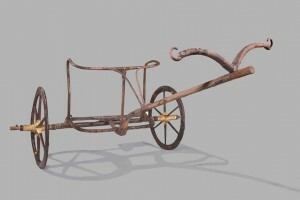 Septicemia from the injury might have contributed to his death, and he could even have been hunting with this chariot when he took that fatal tumble. There’s no way of knowing, of course. Still, it adds a little spice to the artifact which for the first time in its long life has left Egypt and is now winging its way to New York City where it will be added to the Tutankhamun and the Golden Age of the Pharaohs exhibit at the Discovery Times Square Exposition. The chariot will arrive in New York on Wednesday, accompanied by a conservator and the Director of the Luxor Museum, where the chariot is permanently displayed. Okay so it’s not new, and it’s not really even a henge anymore so much as the ditches and postholes therefrom, but archaeologists are still lauding it as the most exciting find on the Salisbury Plain in 50 years. All kinds of smaller finds have been made during that time — from graves and attendant goods to a smaller wood circle — but this could be a major ceremonial monument. Note of caution: We don’t know yet exactly what it is, though. Right now all we see are images of holes, basically. Despite the immense fame of the Neolithic standing stones, the surrounding area is surprisingly unexplored. 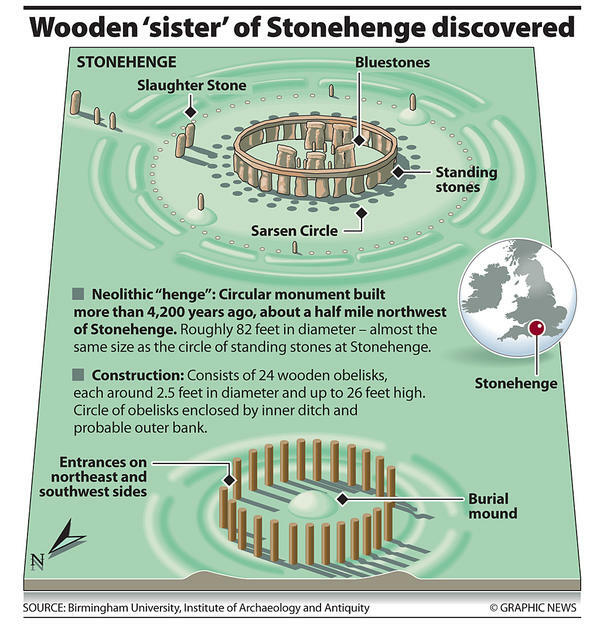 An international team of archaeologists led by the University of Birmingham is surveying the plain to a depth of 3 feet starting with their back to Stonehenge then moving outwards 14 square kilometers (5 square miles). You’d have to deglove the plain and it would take years to do this using traditional pick and shovel methodologies. 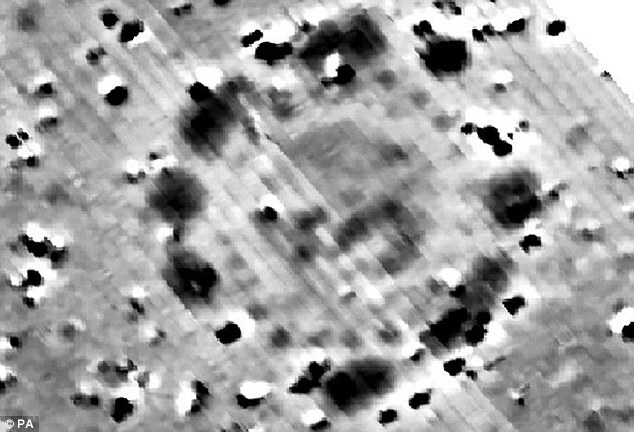 That’s why the archaeological team is using new, non-invasive technology to uncover the secrets of the plain, using scanners attached to tractors to cover large amounts of ground in deep detail very quickly. Technologies used include ground penetrating radar, magnetic surveys, resistivity and electromagnetic studies. Ground penetrating radar is usually deployed by one person pushing the detector. The team scaled the detector up 5 times, attached it to a quad bike and were thus able to cover the 14 square kilometers around Stonehenge in just 3 weeks.